Avianca Costa Rica, formerly known as LACSA (Spanish: Lineas Aéreas Costarricenses S.A.), minority owned by the Synergy Group, is the national airline of Costa Rica and is based in San José. It operates international scheduled services to over 35 destinations in Central, North and South America. The airline previously used the TACA/LACSA moniker when it was a subsidiary of Grupo TACA. Since May 2013, following Avianca's purchase of Grupo TACA, Avianca Costa Rica became one of seven nationally branded airlines (Avianca Ecuador, Avianca Honduras, etc.) operated by Avianca Holdings group of Latin American airlines. LACSA was established on 17 October 1945 by Pan American World Airways, the Costa Rican government and Costa Rican private interests. It started operations on 1 June 1946 and was designated the national carrier in 1949. Its domestic network was transferred to its wholly owned subsidiary Sansa in September 1959. 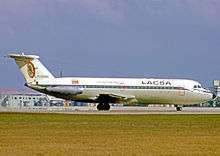 LACSA operated the Douglas DC-6B four-engined piston airliner from 1960 until 1976 on their regular passenger, and eventually freight, scheduled flights to Miami International Airport. The airline introduced the first of their British Aircraft Corporation BAC One-Eleven twin-engined jet airliners onto their Caribbean passenger route network in April 1967. The airline also operated a subsidiary in the Cayman Islands, Cayman Brac Airways (CBA) Ltd., which it sold a 51% controlling interest in the late 1960s to the Cayman Islands government which in turn used the air carrier to form Cayman Airways. LACSA served Grand Cayman for many years as an intermediate stop on its services between San Jose, Costa Rica and Miami. Postal stamp issued to commemorate LACSA's 20th anniversary (1946–66). This same timetable states that all international flights were being operated with British Aircraft Corporation BAC One-Eleven twin jets at this time with the exception of the San Jose-San Andres Island route which was being flown with a Convair 440 propliner. On May 23, 1988, a leased Boeing 727-100, registered TI-LRC and operating the route San Jose-Managua-Miami, collided with a fence at the end of the runway in the Juan Santamaría International Airport, crashed at a nearby field next to a highway, and caught fire. The excess of weight in the front part of the airplane was the cause of the accident. There were no fatalities out of the 23 occupants. On 11 January 1998, LACSA flight 691, an Airbus A320, veered off a runway at San Francisco International Airport during the takeoff roll. The aircraft left the runway at full speed, coming to rest in a field of mud. The runway was closed after the incident, reducing take-off capacity by 50 percent, leading to massive delays at the airport. None of the 122 passengers on board the aircraft sustained injuries, and stayed at a hotel until another aircraft could transport them to their destination, San José, Costa Rica. The cause of the incident was not determined. ↑ "Our History". Grupo TACA. Retrieved 2010-10-21. ↑ "LACSA Lineas Aéreas Costarricenses – Details and Fleet History". Planespotters.net. Retrieved 2010-10-21. ↑ "LACSA". Airfleets.net. Retrieved 2010-10-21. ↑ Rohter, Larry (1998-04-15). "A Home-Grown Giant Of Central America". The New York Times. Retrieved 2009-10-21. ↑ "Taca lanza nueva imagen y servicios". La Nación (in Spanish). San José. 2008-09-25. Retrieved 2009-10-21. ↑ "TACA renueva flota para vuelos al Istmo". La Nación (in Spanish). San José. 2008-10-08. Retrieved 2009-10-21. ↑ "Airliner speeds off runway at S.F. Airport". The San Francisco Chronicle. 1998-01-11. ↑ "Airplane gets stuck in mud after veering off San Francisco runway at full speed". CJOnline.com. January 11, 1998. Retrieved 2009-05-17. Roach, J (2004). Jet Airliner Production List - Volume 2. The Aviation Hobby Shop. Hardy, M. J. (October 1969). "Aviation in Costa Rica". Air Pictorial. Vol. 31 no. 10. pp. 362–365. Wikimedia Commons has media related to LACSA.